Although cling wraps are convenient to use and seal the food tightly but the plastic material used in cling film can harm the quality of food. Moreover, it does not decompose easily so is harmful for the environment too. When we wrap any hot food in cling film, the chemicals from cling film get mixed with the particles of food making it unhealthy. Even cling wrap is not suitable for fatty foods like cheese, pastry or fried meat as it does not allow the food to breathe and food gets spoilt soon. Cling wrap is made from the plastic called PVC which is rigid and to make it soft, additional chemicals called plasticizers are added to it. 40% of the plastic material is made from this chemical which poses threat to food safety. These chemicals disrupt the functioning of endocrine glands and can lead to health problems. Infants and the young ones are more prone to suffer due to the exposure of plastic chemical in food as the chemical in the cling wrap can mimic body’s natural hormones. The material used in making cling wraps can cause obesity, infertility, cancer, suppression of immune system and so on. Various evidences have been seen regarding the toxicity of using cling wraps and so doctors also discourage use of plastic for wrapping food. The time has come to put a regulation on plastic packaging due to growing concern for health related issues. Most cling films that are claimed to be of good quality are actually made from very harmful material and do more harm than any good. These chemicals, with the passage of time lead to genetic damage and bring in hormonal imbalance. Exposure to such harmful chemicals is not at all a good option. Instead everyone should stop the use of cling or plastic wraps and opt for safer alternatives. 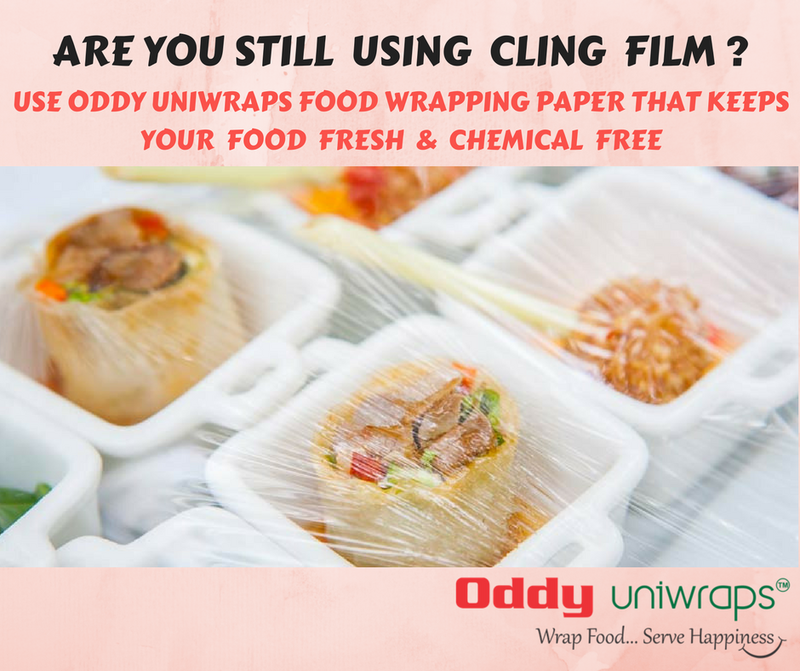 One such alternative to cling wrap is Oddy Uniwrap. It is a 100% Organic wrapping paper which is eco-friendly, re-heatable and also safe for food. It protects the food from getting spoilt unlike cling film which if used for long can lead to growth of bacteria and fungi on food adversely affecting the food quality. Cling wrap covers the food tightly but does not stop water and air to invade the food particles. So, protect your food and health by using healthy alternatives and by avoiding harmful plastic menace. These days cling film is widely used especially for storage of fatty foods like cheese. But it should be strictly avoided because plastic breaks down into the fats. Cheese is a living food which needs to breathe so that the gases it emits can escape and wrapping cheese in cling wrap can retard its aging process. Make sure to keep your food breathing by not wrapping it in plastic and increase its life.